Patricia Cain's series of large scale works that gained her both the Threadneedle and Aspect prize, capture the Riverside Transport Museum by Zaha Hadid while under construction. BROTH art (www.brothart.com) is delighted to launch an exhibition at L’Entrepot showcasing multi-award winning work by artist Patricia Cain. Cain spent 4 years on site at the Zaha Hadid-designed Riverside Museum in Glasgow while it was under construction. Working in pastel from sketches made during these visits, she deftly captured the skeletal structure of this celebrated example of modern architecture. The resultant series of work attracted awards including the Threadneedle Prize (2010) and the Aspect Prize (2010) and paved the way for further accolades, such as the RWS award (2014) and the Arte Laguna Prize in Venice (2014). The recently late Iraqi-British architect Zaha Hadid is well known for her groundbreaking designs, which seem to defy gravity and upturn basic principals of engineering with their gigantic swoops and curves. Her design for Riverside Museum, which the Guardian described as one of her ‘most direct’ is no exception. Featuring a roofline designed ‘as if squeezed from a gothic tube of toothpaste’, the building has a seamless fluidity, which betrays nothing of its construction. Cain’s work exposes the complex process of creating the apparently effortless folds of the museum’s striking , zinc panel-clad roof. 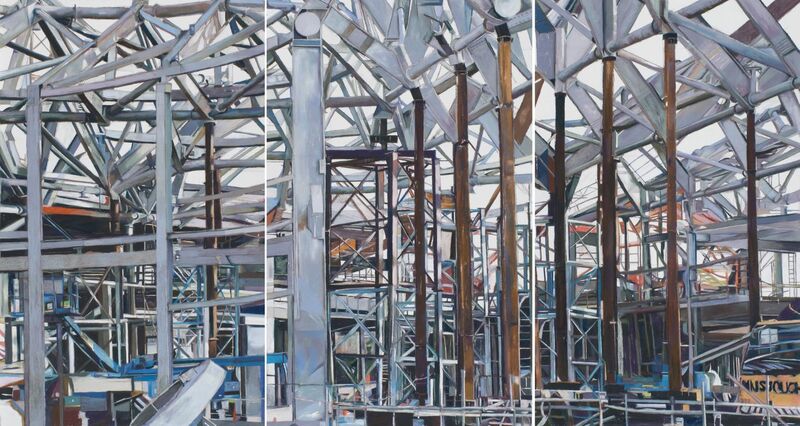 Cain’s work on show at L’Entrepot highlights the dynamic relationships between art, architecture and industry. 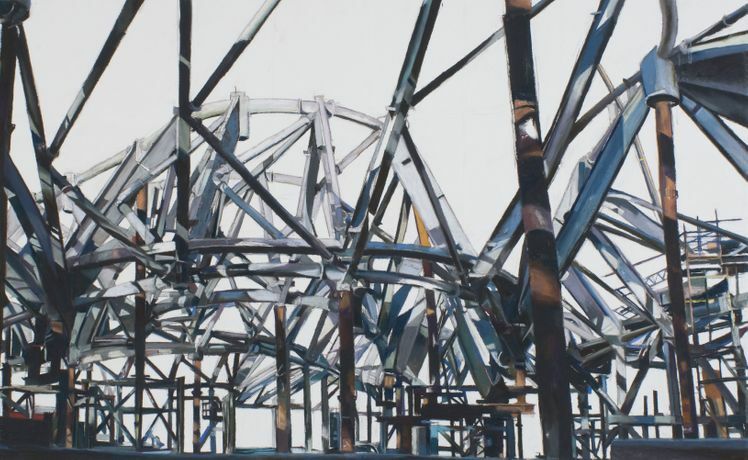 While representational, her meticulously rendered pastels of this towering construction site emphasise its inherent abstract forms. Cain is driven by the belief that the artists’ role is one of the observer and to capture moments in process, she explains. Today’s cities across Britain are seeing unprecedented regeneration and rapid development. The landscape of East London in particular, is a life-form that continues to grow and redefine itself. Build is a series of work that records the process of change and brings our attention to the impressive feats of engineering that are so quickly eclipsed by the architectural outcome. Formerly a lawyer, Patricia Cain is an artist based in Dumfries, author and researcher who completed her PhD through the practice of drawing at Glasgow School of Art. Her practice (drawing, painting, sculpture and public art) is intimately connected to her interest in skill-lead art-making processes, the value of these as First Person research methodologies and the importance of teaching and encouraging skill in this era of concept-led Art Education. Cain exhibits nationally and internationally, winning both the Threadneedle and Aspect Prizes in 2010. Her recently acclaimed major exhibition at Kelvingrove, Drawing (on) Riverside, exposed the nature of practitioner knowledge to a wider lay audience through the observation and response to the construction of Glasgow’s new Riverside Museum which has subsequently been likened to Dewey’s study of the nature of method. BROTH art is a start up gallery based in Hackney, London. Its business model is simple, it takes a grassroots approach, prioritising engagement with the vibrant London arts scene and naturally expanding as a business by trading at art fairs, pop-up exhibitions and through its website. BROTH is devoted to finding and nurturing emerging talent and making their unique works of art accessible to individuals looking to acquire original contemporary art. BROTH provides an expert and friendly service by experienced professionals and prides itself on being personable, approachable and trustworthy. It is BROTH's primary ambition to break away from the stuffy, elitist reputation that surrounds the art buying world and make it accessible to absolutely everyone. Meanwhile, it aims to provide a support mechanism for local artists as well as a London platform for emerging artists from other parts of the world. L’Entrepot lives on Dalston Lane and is run by three friends. Inside the space is attractive, huge ceilings in a warehouse style setting that caters as a restaurant, a gallery, a place to sit and have a coffee and a bar that procures stock from local, independent breweries and distilleries as well as an exciting selection of wine from around the world. L'Entrepot launches a brand new menu this September, spearheaded by Angus Henderson, a pupil of Raymond Blanc who has travelled extensively, cooking around the world. Henderson has taken l'Entrepot's long standing affinity with French cuisine and elevated it with whole-food, fresh and unprocessed ingredients, while introducing flavours from some of the countries he has visited. Henderson explains, "I have always felt an obligation to make food that is healthy,as that is how I like to eat, but also to make it tasty, fun and beautiful. I think this is simple- just use fresh whole-food ingredients of good quality, focussing on plenty of fruit and veg and minimise processing, refining and added sugar".